- The chimney of this lantern is made of ‘fireproof’ glass. Most economical in use, a steady brilliant light for about 8 hours with 1.125 liter of oil. Absolutely strom and rain proof. We are a most dependable name among the topmost entities in this area, indulged in providing Rechargeable LED Lantern to our valued clientele. Portable, light weight, high efficiency, ABS Plastic Body with acrylic chimney, having inbuilt rechargeable SMF battery, Compact Fluorescent Lamp, Omni direction covering 360ºC, Electronic Circuit with Crystalline Silicon SPV module with Over Charging, Deep Discharging, Reverse polarity protections. 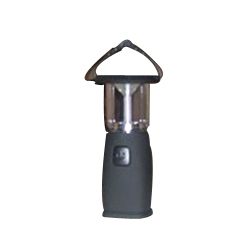 - Function: Rechargeable Handy Lantern With Automatic Light Up & 360 Degree Rotation Foldaway Hung Hook. - 9 White LEDs & 2 Red LEDs Flashing. - Illumination brightness of each : above 13000 mAh. - Batteries : NI-CD / MH storage batteries with 3.6V/500mAh. - It can be used as reading lamp.